Diathermy (synonym: endothermy, thermomineral) is a method of physiotherapy, which consists in heating of tissues and organs through electric current of high frequency (1,0-1.65 MHz) with the power up to 2 a and voltage up to 150 C.
Diathermy is shown in subacute and chronic inflammatory diseases of different organs and systems, dystrophic and commissural processes, spasms of blood vessels, vocal cords, stomach and intestines, stomach ulcer of a stomach and a duodenal ulcers with no tendency to bleeding, as well as with lobar pneumonia (in combination with antibiotics) and nephritis. Diathermy is contraindicated in purulent processes, tuberculosis, diseases of the nervous system with the loss of temperature sensitivity, inclination to bleeding, toxicosis, malignant tumors, sharp depletion, metallic foreign bodies in tissues. Fig. 1. Apparatus for diathermy "UDL-350". For the procedures of use of diathermy apparatus "UDL-350" (Fig. 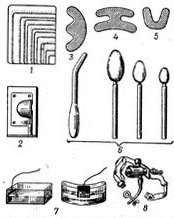 1), "UDL-200", lamellar and penetrating the electrodes and electrodes-trays of various sizes and shapes (Fig. 2). All types of electrodes connected to the devices for diathermy wires in the high-frequency isolation and clamps or soldering. Plate electrodes are placed directly on healthy skin and fixed, like pens abdominal electrodes, bandaging. Other methods of fixation of the electrodes is prohibited. If uneven surface on which to place the electrode, and if volosatoi under the electrode placed hydrophilic pad moistened with 10% solution of sodium chloride, or use the electrode bath, filled with the same solution. Plate electrodes after drinking alcohol wipe, abdominal sterilized by boiling. 4 - the sciatic nerve. Treatment methods diathermy can be local, segmental (Fig. 3) and the General. 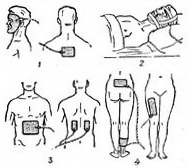 When segmental methodology one electrode is placed on the area of the cervico-thoracic section of the spinal column, the other - on the wrist or hand, or one electrode is placed on the lumbosacral area, and two others - on the front surface of the thighs. Procedures depending on the current density (3 to 5 mA to 1 cm2 electrode) and time (20-30 minutes, sometimes up to 1.5 hours). Apply procedures often through the day, up to 15-20 per course of treatment. All diathermy apparatus must be earthed via a special grounding circuit; all metal pipe in the offices on 2 l from the floor close insulated ducts; metal housing units diathermy protect the screen or covered with oilcloth; in the house, dressing, at home metal parts Desk, bed cover woolen blankets and oilcloth. On the tiled floor staff put a rubber Mat with an area of 1 m2. The diathermy gradually replace method inductothermy (see) and microwave therapy (see).